So, I kind of dropped the ball on this one... We had set up the hype to last us throughout the week, then -BAM- Friday hit. On the one hand, we still "cooked;" however, our meal was not homemade. We resorted to frozen Wegmans Manicotti dinner, and weren't disappointed. It's not the most healthy option; however, I failed to wake up early enough to put together a proper pot roast, and opted to rather rush out the door and return home to make manicotti. 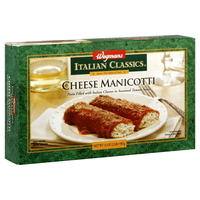 Wegmans has a great variety of frozen food items, and although Nick's mother's manicotti will always have my heart, this was a nice end-of-the-week fix.